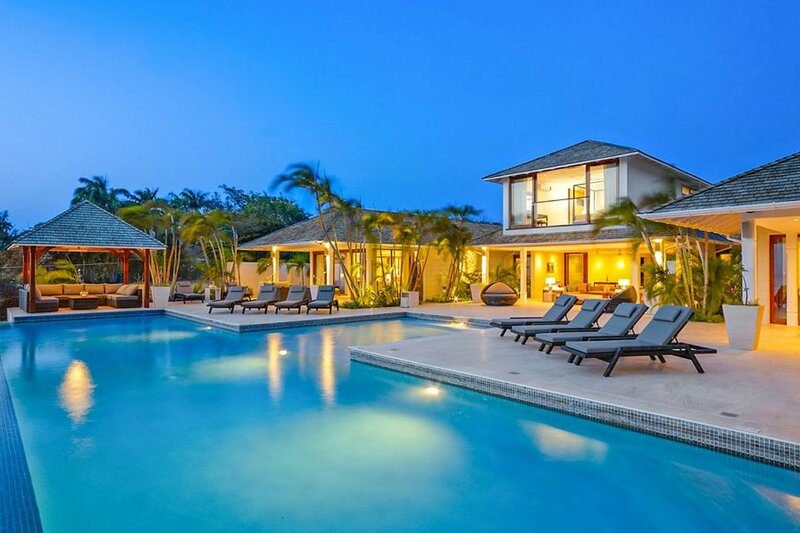 Heywoods Villa is a special holiday retreat on the Bajan West Coast. Honeymooners and those seeking a dream vacation of a lifetime will not feel short-changed here. Regardless of the occasion, this extravagant home away from home will not disappoint even the most lavish tastes. The villa's gorgeous design and contemporary furniture are complemented by vibrant local art adorning the walls. Guests will be delighted with the villa's wonderful interior of natural coral stone walls, wooden floors and custom-made furniture imported straight from Indonesia and Bali. The living room is not only a living and social space, but it opens up onto a terrace that provides panoramic views of the Caribbean Sea. This is similar to the kitchen which extends onto the terrace's dining area, for scenic al-fresco eating. The well-equipped kitchen comes with a De'Longhi coffee machine and a breakfast bar with seating for eight. Outside, the pool deck is large enough to be utilised as a sun-catching spot in the daytime and a social area for gatherings that go on well into the night. This is accompanied by the barbeque grill on the terrace and a small outside shack furnished with plush, cosy sofas right beside the pool. Some of the villa's most luxurious features include bathrooms with bowl-shaped sinks, bedrooms with white decor and walls, and a media room complete with a 55" LCD HD television, Blu-ray and a Nintendo. Heywoods Villa is a super modern 6-bedroom villa, that I perfect for a fun-filled family holiday. The outside area has an infinity swimming pool and a gazebo looking over the Caribbean sea. Heywoods Villa is situated in the countryside in the charming Parish of Saint Peter. The villa is just a short walk (around 100m) to Port St Charles and its nearby beaches. Port St Charles Yacht Club is a full-service bar and restaurant that provides fine dining on the seafront during lunch and dinner whilst taking in panoramic views of the West Coast. The deep-fried coconut shrimp and catch of the day are highly recommended. During the months of December to April, the venue hosts events every Friday night, including performances from Barbadian band Fire and Ice. Fisherman's Pub is another great venue to try some of the island's tastiest dishes in. The pub is a great way to take in some of the island's culture whilst enjoying the relaxed and friendly ambience. Serving traditional Bajan food, the pub is known for its delectable fish cakes, baked pork, beef stew, fried plantain and carrot rice, all enjoyed in the restaurant's traditional rum shop design and prepared the local way. If you want some fish to take home and create your own Bajan inspired concoctions, Six Men's Fish Market is a great place to purchase local fish at. The well-known fish market sells everything from everyday tuna and flying fish, to the more exotic dolphin and marlin. Every Friday night the opposite rum shop transforms into a lively and sociable spot with music, dancing and drinks.